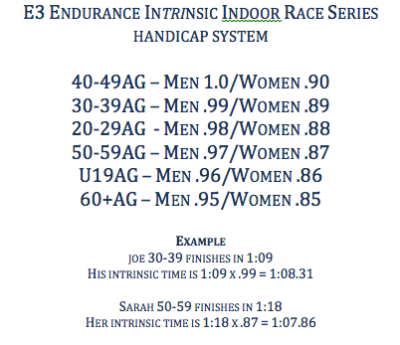 E3’s Intrinsic Triathlon Series is a series of 4 indoor triathlon races which gradually take athletes into the race season in prime conditioning. Each race will take place at The Club at Oak Branch pool, starting in the pool, moving to E3's CompuTrainer Studio, and then finishing on the treadmills. There will be 3 waves with 8 competitors in each wave. All athletes will receive series points for each race on an age-graded handicap system that allows for any age and gender to take top billing, and become the E3 InTRInsic Champion! The 9:00 & 10:00am races will be the same sprint distances (500yd swim, 10mi bike, 2 mi run) for ALL FOUR RACES. The 11:00 race will progressively increase throughout the series with the distances listed above.